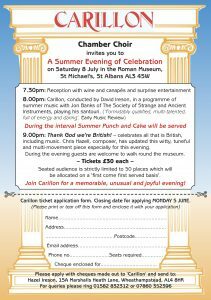 A summer evening of celebration – wine and canapé reception at 7.30 pm with surprise entertainment, then summer music conducted by David Ireson with Jon Banks of The Society of Strange and Ancient Instruments. (‘Formidably qualified, multi-talented, full of energy and daring’). Early Music Review. Interval refreshments and the chance to explore the museum. Only 50 seats available. Tickets £30. CLOSING DATE FOR APPLICATIONS MONDAY 5 JUNE. NO TICKETS WILL BE AVAILABLE ON THE NIGHT.